WILLIAMSTOWN, Ky. -- Imagine miles of sidewalks that connect neighborhoods and schools, playground areas and walking paths designed with youngsters in mind, and school gardens chock-full of fresh fruits and vegetables. If this sounds like a little slice of heaven for kids, just wait until you hear about the active workstations that allow students to pedal while seated in the classroom. If you haven't been to Grant County for a while, that's what you've been missing. It's all part of Fitness for Life Around Grant County's health action plan for children. The nonprofit is in the midst of a three-year, $600,000 project aimed at reducing childhood obesity. The group received a big boost in funding from a Foundation for a Healthy Kentucky grant two years ago and will serve as a model for other communities across the commonwealth. "Our goal is to increase not just physical activity but also healthy food choices for our children," said Marc Tepe, the organization's treasurer and project coordinator for the grant. "We hope to create a healthier, more connected community for our kids." The organization has a small army of partners, including the Northern Kentucky Independent District Health Department. It was launched in 2002 in response to the county's growing childhood obesity rates. The problem: Grant County faces a plight similar to many other rural communities. About 65 percent of its children are eligible for the federal Free and Reduced Lunch Program, and more than 35 percent of its students are clinically obese by 10th grade. Play areas are minimal, and many areas in the county are unsafe for children to walk or bike. Fitness for Life Around Grant County aims to change that with its Starting With Children initiative. Over the past two years, new wellness policies have been established at both Grant County and Williamstown Independent schools. The group has also created play spaces at schools and parks, paved walking trails and community gardens. The grant funding also allowed the purchase of active workstations for classrooms that allow students to pedal at their desks while sitting or raise their desks so they can stand while doing schoolwork. "For us, it has been a whole new world," said Christy Roberts, a health and PE teacher at Grant County Middle School. "We can take our students outside every day to use the walking path, and we have more options now to help our kids stay active." 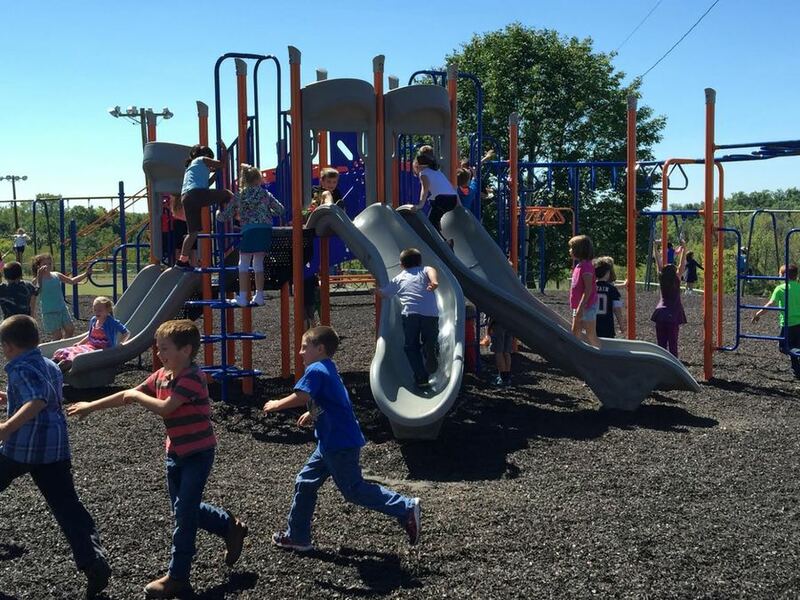 New playground equipment at Williamstown Elementary School is part of the Fitness for Life Around Grant County initiative. The initiative in Grant County is part of a larger, statewide initiative led by the Foundation for a Healthy Kentucky. The Louisville-based nonprofit invested $3 million in similar programs throughout the state to help reduce Kentucky students' risk of developing chronic diseases. Groups that received grant funding had to secure matching funds from their communities. Locally in Grant County, the additional funds came from a variety of community partners and supporters. "Our aim is to support these coalitions in expanding their membership, formalizing their structure, gaining momentum, and strengthening their partnerships with schools to create successful programs that can be replicated across the commonwealth," said Susan Zepeda, the Foundation for a Healthy Kentucky's president and CEO. For those who have been working with Fitness for Life Around Grant County since the beginning, the momentum the grant has created locally is exciting, according to Marsha Bach, a health promotion manager for the Northern Kentucky Health Department. "From the beginning, we felt like we were taking baby steps and making some small changes," she said. "We're now making big strides and feel like we're really changing the culture in Grant County." The best part is the feedback they get from Grant County's kids, she said. Piddle Park is one of their favorites, she says. It offers a skate park, tennis and basketball courts, baseball field and playground area. "Kids are there all the time," she said. "They call it ‘our park.' They've really taken ownership of it, and that makes us very happy. "That's what this initiative is all about." The kids in Grant County have even more to be excited about. Bach said the third phase of the initiative, which begins in October, includes a splash park. It will be located off Waterworks Road in Williamstown. A new trail system will make it accessible to people all over the county, she said. For details about the project, visit Fitness for Life Around Grant County's website here .